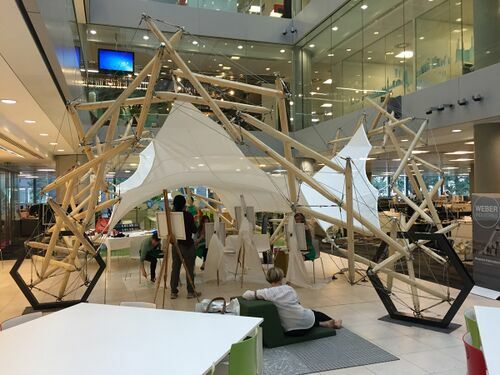 Read here about pavilions designed with tensegrity concepts. A pavilion in tensegrity research generally refers to a relatively small, free-standing structure intended to be sited in a temporary exhibition space or a short distance from a main building. These pavilions usually have a connection with experimentation or display in their intended use. Pavilions often feature a verandah to provide protection from the sun for spectators, such structures are often deployed at sports events or street fairs. "Tension," was the title of a tensegrity pavilion deployed at the Vision London 2016 exhibition. 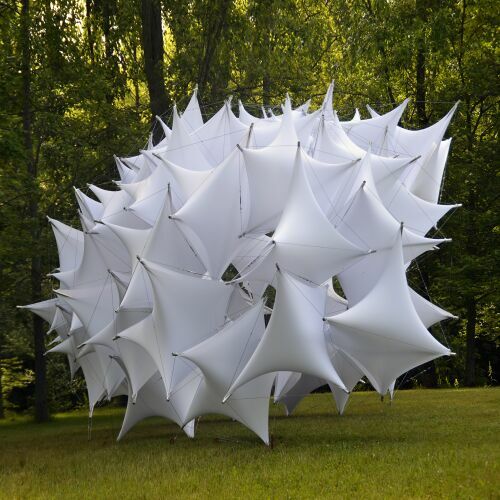 Tension is a lightweight pavilion with a tensegrity ring and a tensile fabric membrane. The sinuous geometry provides a minimal base on three points, with three arches between to generate an anticlastic fabric surface. This doubly-curved surface makes the tensile fabric strong when resisting loads in any direction. There are 24 tensegrity modules to form a torus, which have varying geometry to generate the smooth curvature. The coordinates were generated using Grasshopper, parametric modelling software, and the pavilion was analysed using Oasys GSA. 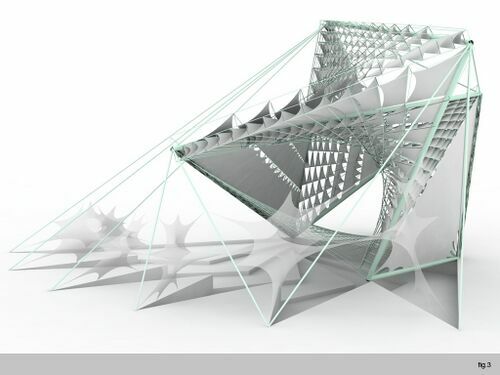 StructureMode performed the form-finding to derive a stable tensegrity geometry and rigorous non-linear analysis to optimise the size of all elements to achieve efficient use of materials. For more details see Tension Pavilion 2016. The Underwood Pavilion was built by Gernot Riether, Andrew J. Wit and Steven T. Putt at Ball State University's Digital Design Build Studio during the summer of 2014. The structure is composed of fifty-six three-strut tensegrity modules. By parametrically adjusting their dimensions, the designers were able to control both the curvature of the pavilion and the size and shape of several openings that frame views of the site. Each module is dressed in white Elastan, a performance fabric. For more information, see the full article Underwood Pavilion by Riether, Wit, Putt. Underwood Pavilion. Photo by Gernot Riether." link="Underwood Pavilion Photo Gallery"
For more details see Underwood Pavilion by Riether, Wit, Putt. 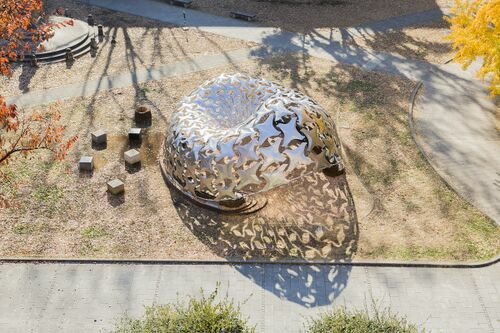 99 Failures was a pavilion built by the University of Tokyo Digital Fabrication Lab in 2013. The pavilion was conceived in October 2012 at the University of Tokyo Graduate School of Department of Architecture and Architectural Engineering Yusuke Obuchi laboratory and Atsushi Sato laboratory. The Obayashi Corporation played a key role in the implementation. 99 Failures Pavilion by University of Tokyo Students. Photo by Hayato Wakabayashi"
For more details see 99 Failures Pavilion by University of Tokyo . The Blur Building was a media pavilion built for Swiss Expo 2002 at the base of Lake Neuchatel in Yverdon-les-Bains, Switzerland. 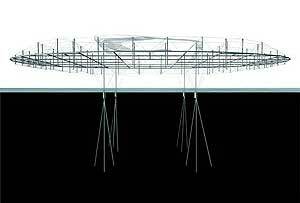 From piles in the water, a system of rectilinear struts and diagonal rods cantilevered out over the lake. Ramps and walkways wove through the system, some of them providing a counterweight for the structure. "It was an exhibition pavilion with nothing on display, except for our cultural dependency on vision," said Diller. Blur Building Tension Structure Framework, by Diller and Scofidio" Blur Building by Diller & Scofidio"
A tensegrity pavilion is proposed. The tensegrity features many tensile elements as well as additional tensile anchors. See Tensegrity Pavilion AA School 2010. 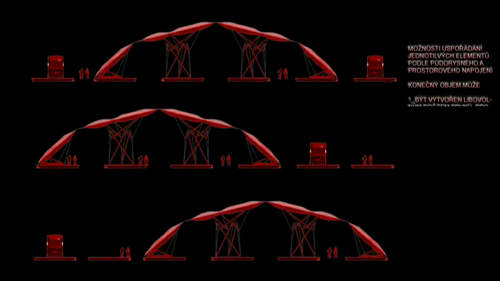 "Tensegrity Pavilion AA School 2010"
A pavilion is proposed, its roof supported by tensegrity structures. See Josef Musil. Side view of tensegrity pavilion by Musil" "Musil, Josef"
This page was last edited on 27 January 2019, at 10:53.